How do I conclude my course at the end of a semester? Concluding a course means that you and your students will have read-only access to the course. If your institution uses software that automatically concludes enrollments, you do not have to manually end your course since the end date of the course will automatically conclude the course on your behalf. If you prefer, you can change the end date of your course instead. Note: This option is a permission disabled on a course-by-course basis. If the Conclude this Course button does not appear in Course Settings, this setting has been restricted for your course. If you are an instructor, contact your admin for assistance. 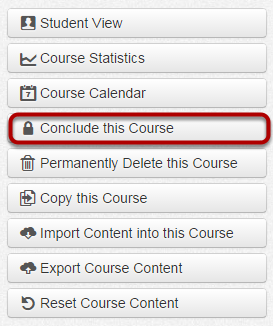 Click the Conclude this Course button to conclude your course. Click the Conclude Course button. A message will appear at the top of your screen confirming the conclusion of your course. Note: Admins can un conclude courses if necessary. If you are an instructor, please contact your admin for assistance.